There’s a new boot in town, and it means business. 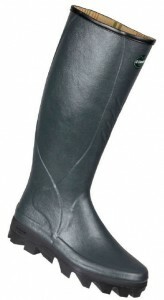 I am of course talking about the Le Chameau Cérès Jersey Boot, made with a Michelin sole. Yes, the people who make tyres. This union might sound a little strange, but it comes from a need for a hardwearing agricultural boot, and the launch of Michelin’s new agricultural tyre, the Agribib. Both Le Chameau and Michelin are strong, French brands known in the agricultural and rubber industries. The sole of the Cérès Jersey Boot is the same structure as a Michelin tyre, with Ultraflex technology and offers better grip, comfort, resistance and soils protection. Michelin are known for being experts at managing contact with the ground, so it is no surprise that they have created a sole for Le Chameau. If you’re wondering about the name, Cérès is Latin for agriculture, harvests and the fecundity goddess, which is appropriate for the purpose of the boot! In terms of what it can offer, the Le Chameau Cérès Jersey Boot is light, made from natural rubber, with a comfortable Jersey lining. The sole offers pneumatic-like grip for high performance, grip, longevity and comfort so that you can be sure they are built to last. Le Chameau boots are handmade which means that each boot is unique. With two strong, French brands on board, Michelin and Le Chameau have created a beast of a boot in terms of look and usability. This is not a boot you would expect to see anyone wearing casually around town, or when out for a stroll, but for anyone working in the countryside, it is definitely a revolution in terms of performance. To view this boot, or for more information, click here. Cérès Jersey Boot, Chameau Michelin, Le Chameau, Le Chameau Cérès Jersey Boot, Le Chameau Michelin, Michelin, new Le Chameau. Bookmark.